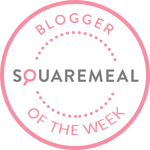 Having worked in the Fitzrovia area for just over a year, I’ve been fortunate enough to be surrounded by some awesome eateries in this part of central London. From Korean cuisine at Bibimbap to middle-eastern dining at Honey & Co, there really is something different around every corner. I thought it was about time I gave three of my favourite Fitzrovia haunts some airtime. Whether it’s mouthwateringly good salt beef that you’re after or something carbolicious to cure your midweek craving then keep reading. Italiano Coffee Co (ICCo) is a coffee shop and pizzeria offering authentic Italian style pizza’s, pastas and other delicacies in Goodge Street. Essentially it’s a one-stop-shop for freshly made, counter collection pizzas for you to takeaway or eat in. 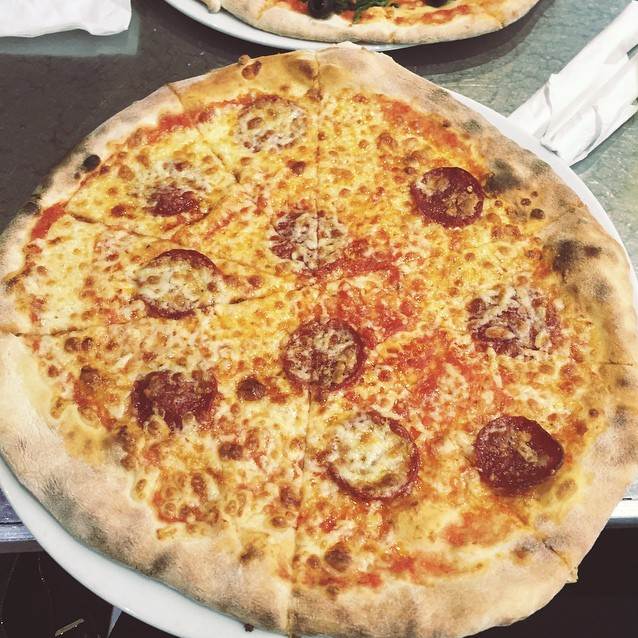 The steel diner fits perfectly with the price of pizzas on offer, starting from £3.95 for a Margarita to £6.70 for an Al Caprino (it’s the goats cheese that does it). I almost always opt for the £5 Pepperoni, it’s thin cheesy base totally hits the spot and doesn’t break the bank balance. 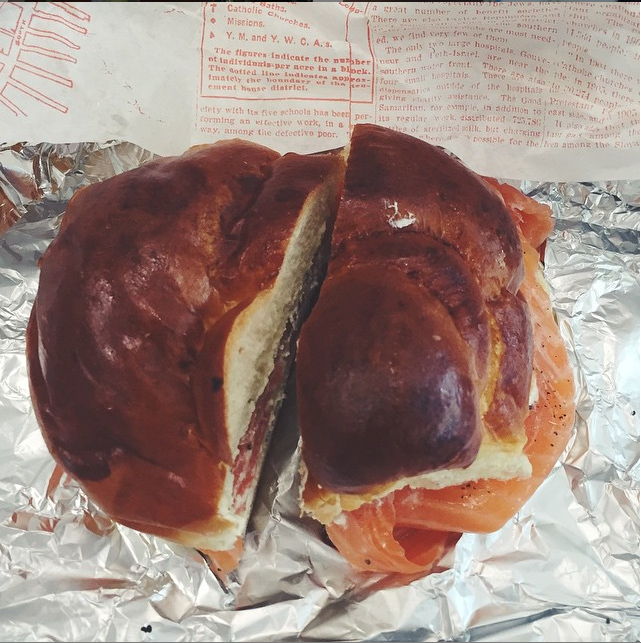 Delancey & Co pays homage to an NYC deli with sandwiches featuring salt beef, smoked salmon and smoked turkey. 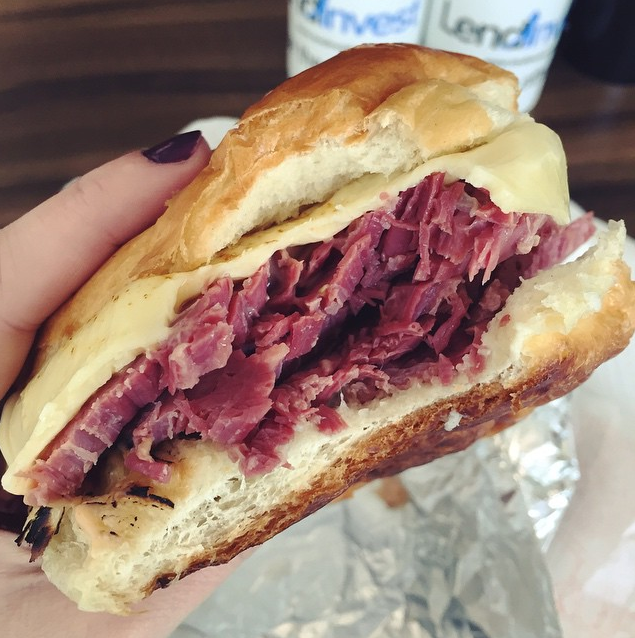 The menu is overly confusing offering classic sandwich fillings both in their simple form and in slightly more elaborate presentations such as the Reuben (salt beef, sauerkraut, swiss cheese). Delancey’s interior is stylish and modern, attempting to offer a counter service for salt beef, smoked salmon and smoked turkey alone.  There always seem to be one person too many behind the counter which can cause serving confusion, but the staff always have a smile on there face nonetheless. On one occasion my colleagues received one slice of bread covered in English mustard and the other with American due to two members of staff constructing the same sandwich! 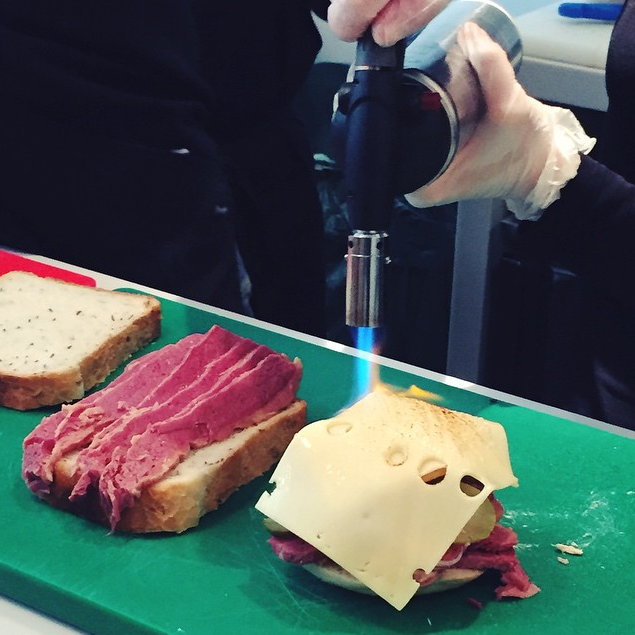 Mishaps aside, Delancey & Co do serve the most mouthwatering salt beef this side of the Atlantic Ocean. My favourite comes in a Challah Roll with Delancey & Co Special Sauce and melted cheese (£8.75). The Smoked Salmon comes at a slightly more affordable price of £6.75. Load it up with cucumber, capers, avocado, red onion, pickled cabbage and cream cheese, which is available plain, low fat, with chives, with black pepper & chilli, pink horseradish or even dairy free. 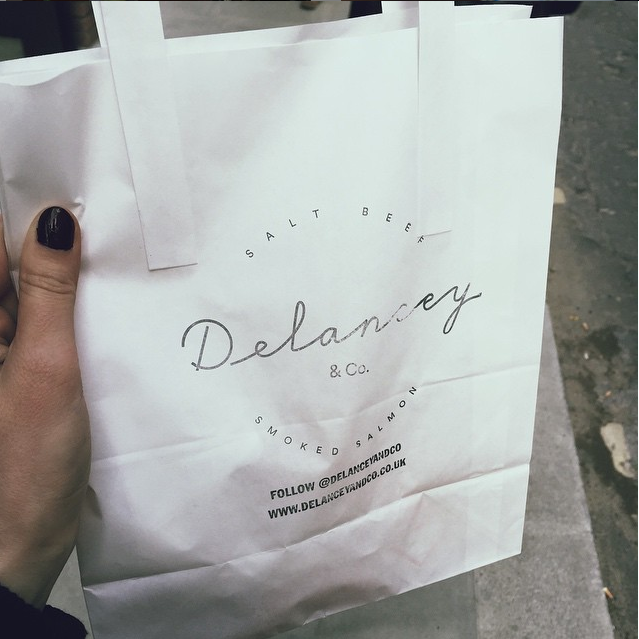 Delancey & Co offer tons of sandwich supplements and condiments which means you’re bound to walk away with the perfect sandwich. Good news! Delancey have just informed me that they recently updated their menu and prices have dropped. Check out their menu online here. Fitzrovia’s Green Man claims to be a traditional London cider-house that definitely knows and loves its apples. 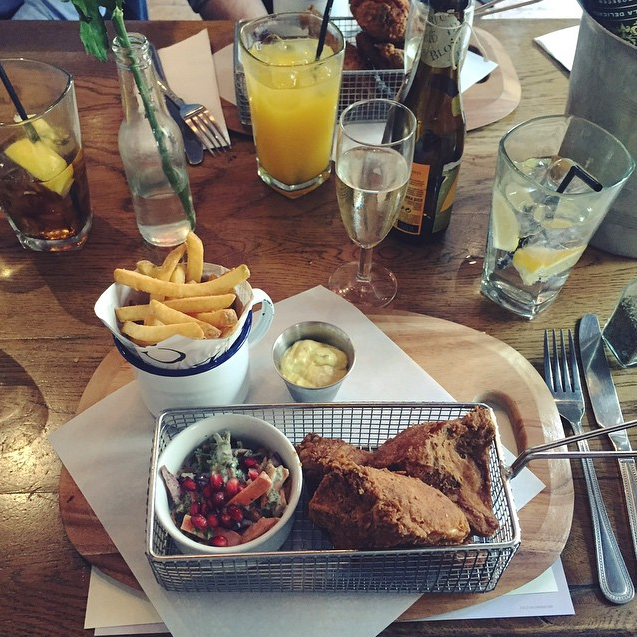 As well as offering 9 draught ciders & three real ales on tap they also serve a pretty mean Southern Fried Chicken. Having enjoyed several portions of The Green Man’s fried chicken, I can tell you now that they recently upgraded their coleslaw with the addition of pomegranate seeds – fancy! Three pieces of juicy, seasoned fried chicken sit in a metal basket on a wooden board alongside fries, a mayo dip and slaw. How can you possibly go wrong with that? If you live or work in Fitzrovia and wish to share your favourite lunch spots with me then posts your comments below. Happy eating!